Our property has a lot of citrus trees on it, all were abandoned for several years and we’re trying to bring them around. Most are Valencia oranges, but there are three of these oranges I can’t identify. The trees are much smaller than the Valencia’s. The fruit is smaller too, with an tendency to be wider than tall. The navel ranges from a tiny pin hole to a weird inverted cone thing- couldn’t get a picture of that extreme but I show a couple of the more common variants. Peel is very smooth, peels easily, very few or no seeds. The fruit is definitely not for juicing, it’s firm, And it’s vesicles separate easily without bursting. They’re just starting to ripen to good flavor now, overlapping with but somewhat later than the Valencia’s here. Once I finally ate a really ripe one I was really impressed- very sweet and delicious flavor. Any ideas ?? Thanks in advance! No one wants to hazard a guess on this? Well, one telltale sign, it does have a navel. Well most don’t, actually. Most look more like the top one in the 5th photo. And both the tree and the fruit are too small to be California navels. 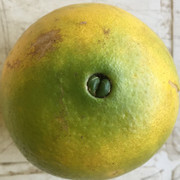 Pin hole or not, it still Is some sort of a navel orange. After tasting how would you rate the sweetness? I was picking way early for a while but finally tried one that must’ve been really ripe because it was very sweet. This is all so subjective and words are inadequate but for sweetness I’d easily rank it up there with a California navel. The most pronounced thing I notice with this fruit is the compactness of the tree. They really stay small.